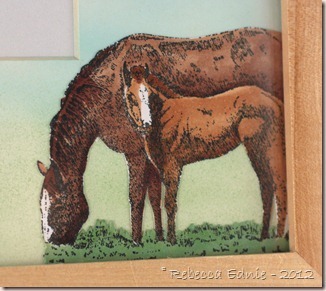 Another horse themed blog post. Seems to be a theme huh? And there is one more to come! The cards I made for the fundraiser. I made this for my son’s riding teacher. She is also my friend’s daughter so it will be perfect for their home. This started out as a basic frame from IKEA. Less than $10 for sure, maybe less than $5! I wouldn’t buy it for my stash unless it was pretty cheap. I cut some clouds with a PTI die out of Eclipse tape and used them as masks. Then I airbrushed the sky and grass. In case you didn’t know, you can totally air brush with Ciao markers. I keep a small elastic wound around my airbrush several times which holds them in place and keeps them from moving as I work, easy solution for sure. Because the Ciao marker slides in too far, I just align the amount of the marker tip that protrudes until it is the same as a Sketch marker and let the elastic snap tight. I stamped and coloured the horses with Copics of course. 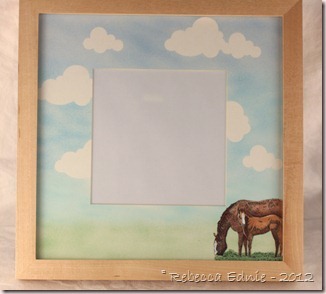 This would totally work with a thrift store frame and a fresh new mat too. I can think of so many fun ideas for images that would work with the same sky and grass. A child holding flowers or balloons, a pet, a bird in the sky with a picket fence below or a baby carriage. Or you could add glitter to the lower part for a snowy scene.